Pattaya celebrates Asanha Buscha and Kao Pan Sar. Thread: Pattaya celebrates Asanha Buscha and Kao Pan Sar. 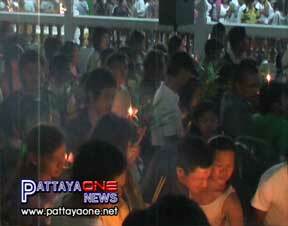 On Tuesday Pattaya celebrated Asanha Buscha Day. Asanha Buscha anticipates Kao Pansa, the three month period of Buddhist penitence and fasting also known as Buddhist Lent which started on Wednesday. Buddhist Lent starts on the first day of the waning moon of the eighth lunar month. The tradition of Buddhist Lent or the annual three-month Rains Retreat known in Thai as "Phansa", dates back to the time of early Buddhism in ancient India, all holy men, mendicants and sages spent three months of the annual rainy season in permanent dwellings. They avoided unnecessary travel during the period when crops were still new for fear they might accidentally step on young plants. We went to the Chaimongkon Temple in South Pattaya for the celebration which began early in the morning with offerings made to Monks known in Thai as “Tamboon”, this was preceded on Tuesday Evening with “vientienne” which requires worshippers to walk around the temple three times. Many hundreds of worshippers attended the evening event and they all made their way slowly around the main temple building in silent prayer and contemplation. Some Bars defy Police Orders and continue to serve alcohol during religious holiday. Pattaya is currently experiencing two dry days where the sale of alcohol is not permitted because of two religious events known as Asanhar Buschar and Kao Pansar also known as Buddhist Lent. The majority of bars around Pattaya were closed on Tuesday Night; however some appeared to ignore the order from Police to close and were blatantly selling alcoholic beverages at their establishments. We understand from Pattaya Police that 10 bars were closed down during the night and further action is expected to be taken because of their disregard of the police order to close. Bars are mostly expected to remain closed on Wednesday Night, however it is thought that more will be open on Wednesday Night than on Tuesday. Here is my Budda day photos, my family going off to the wat with their offerings. daughters in front, Mia luang on the right and Mia noi on the left.